Join us to discover the ‘Spirit of John Muir’ at a special event in the Helix Park Visitor Centre under the gaze of the Kelpies, Falkirk, Tuesday, May 3rd. 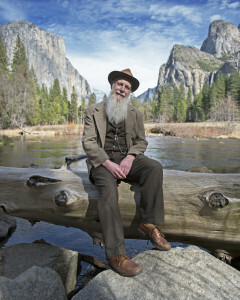 Lee Stetson (left), from California, is the 21st century embodiment of John Muir the ‘Father of National Parks’. In this, the year that the United States National Park Service celebrates its Centenary, Lee is visiting Scotland to experience the John Muir Way from Helensburgh to Dunbar. During his visit Lee will appear live at a small number of venues including the Visitor Centre at the Helix Park, Falkirk. You can join him for an entertaining evening of yarns and tales about the thrilling adventures of John Muir – Scotland’s most famous environmentalist. Enjoy an audience with ‘John Muir’ within The Helix visitor centre discovering all about John Muir’s thrilling adventures in his beloved western wilderness including The Perilous Night on Mount Shasta, his astonishing ride down a Yosemite Valley canyon wall on a snow avalanche, and climbing the 500 foot wall of the winter ice cone beneath the Yosemite Falls – all of which are just a few of his amazing (and true) adventures. Tickets cost £4.95. Refreshments will be available before the event and during the interval. This entry was posted in Blog on 29 March 2016 by Steve Priddle-Higson.